That's it, We Are Premier League for another season. Norwich and Fulham can't catch us and as things stand only 1 of Sunderland or Cardiff could mathematically get as high as 39 points so another season in the top flight is guaranteed. Obviously this game will be remembered for a long long time for that finish from Shelvey (the amount it dips at the end is incredible, everything about it is absolutely perfect). He's certainly not afraid to have a pop from distance, last season Swansea only scored two league goals from further out than the D but Jonjo has done it 4 times himself this season (along with another from the edge of the box v Fulham). 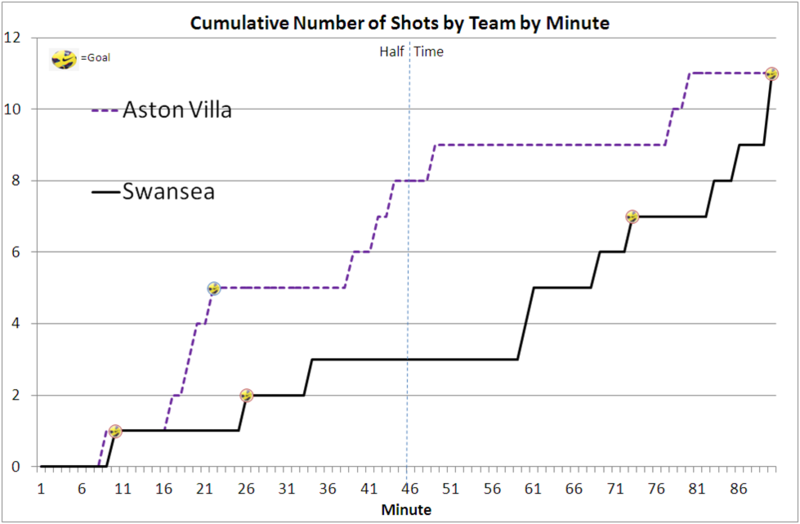 Given the goal and Premier League survival it seems a bit churlish to be over analytical of the performance, but the fact that Swansea scored from their first two shots (and only had 3 overall in the first half) suggests that it was one of those days where things go your way.